New Seal-Fast Repair Hero roof flashing from Mule-Hide Products Co. is an all-system, all-weather maintenance and repair product. A universal solution, the solvent-based, fiber-reinforced terpolymer sealant adheres to all roof substrates, including asphalt, modified bitumen, metal, TPO, EPDM, PVC, Kynar, concrete, Elvaloy/PVC, Hypalon (CSPE) and polyisobutylene (PIB). Ready to work in all conditions, Repair Hero can be applied to dry or wet surfaces and under water. It can be used in any weather – rain or shine and in any ambient temperature. According to the manufacturer, its exceptional elongation and high tensile strength enable Repair Hero to out-perform asphalt-based cements and silicone-based roof patches. It delivers excellent adhesion, out-sticking silicone-based patches in TPO and EPDM applications. It withstands soaring temperatures and intense exposure to ultraviolet light – conditions that can cause asphalt-based cements to become brittle and crack. It is 50 percent more elastic and more than 9 times stronger than silicone-based roof patches, enabling it to better withstand building movement, foot traffic and the poundings dealt by Mother Nature. 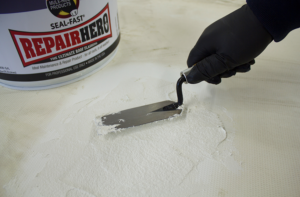 Repair Hero complies with VOC-related regulations in all 50 states and does not need to be mixed or stirred before use and does not skin over or separate in the can after opening.